This went along with a very cute first week in kindergarten lesson that I did. I read both books, "The Kissing Hand" and "Look Out Kindergarten, Here I Come!" After listening to both stories the students drew in the circles things that they remembered in the stories. 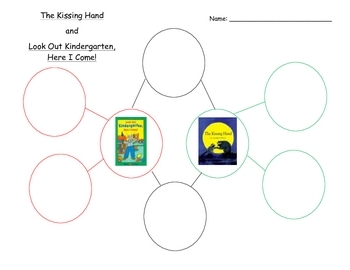 This is a great way to introduce graphic organizers to a young age. Later on in the school year I had them write in the circles. Email me for more ideas!! !